The work "King of Falafel" is a continuation of Shahar Marcus’s video works that deal with Israeli cultural symbols, manifested by various food rituals. 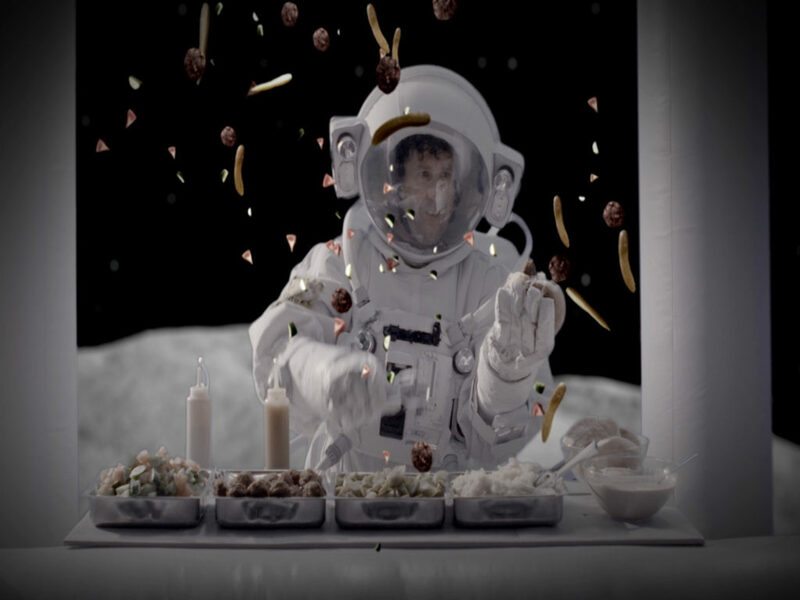 The current work takes place on the moon and depicts a fictional event – the opening of a new falafel stand. The video begins with a wide-shot of space and continues with Marcus, dressed as an astronaut, landing on the moon. After getting ‘lost in space’ he finally notices a flag and realizes he has reached his final destination. 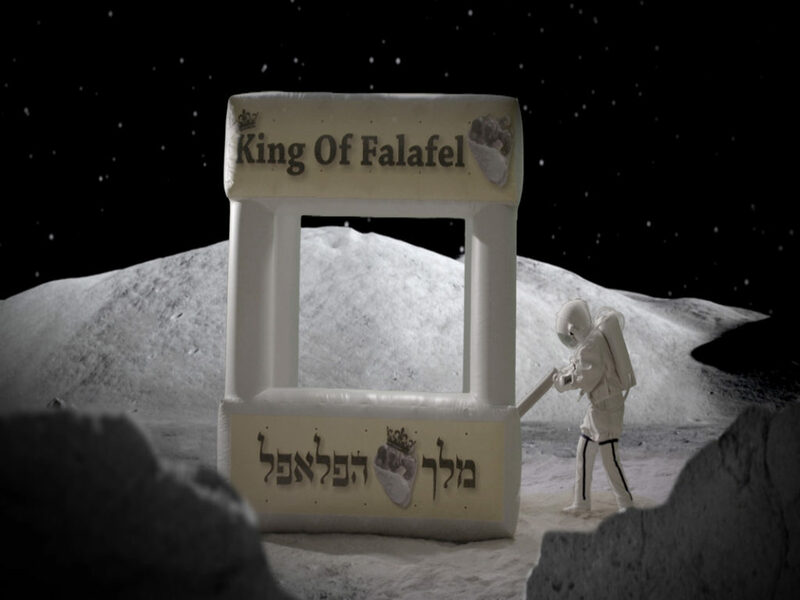 Thereafter, he opens an inflatable falafel stand and puts up his own flag with the inscription: “King of Falafel”. After struggling with the making of the dish, his ultimate success is celebrated with a triumphal ‘selfie’. This humorous piece, shot in the spirit of ‘space adventure’ films, touches a few historical and contemporary socio-political issues. The major theme of the work is the discovery and conquest of a new frontier. This theme plays a major part in the Zionist ethos and the early formation of Israel. It also echoes the history of America and the Western European Colonial past. By depicting an astronaut who is wearing a white suit with blue stripes that resembles the Israeli flag, Marcus reflects on a contemporary ‘Colonialist’ phenomenon in the shape of Israeli tourism. This phenomenon is mainly expressed by the opening of Israeli food venues abroad as a form of cultural compulsion. As opposed to the European Colonial worldview of enforcing their ‘superior’ knowledge upon the local population, in this work, the conquering culture is that of simple street food folklore – the falafel. Ironically, the famous historical rivalry between former USSR and USA over the landing on the moon is thereby defeated by an Israeli pioneer – the first one to set up a food stand in space! By situating this surreal event on the moon – the symbol of future and progress – Marcus emphasizes the never-ending, universal human strive for conquering new and ‘undiscovered’ frontiers.